We're gearing up for Thanksgiving! I'm not going to sweat decorations. I'm not going to sweat making the house look perfect for Thanksgiving dinner. I'm giving us until Saturday to make the house look nice, and that's because the Christmas decor is going up! As a matter of fact, Thanksgiving dinner will be lunch at noon, and at my dad's house. We're still cooking, but I'm so relieved that we just have to concentrate on the food now. 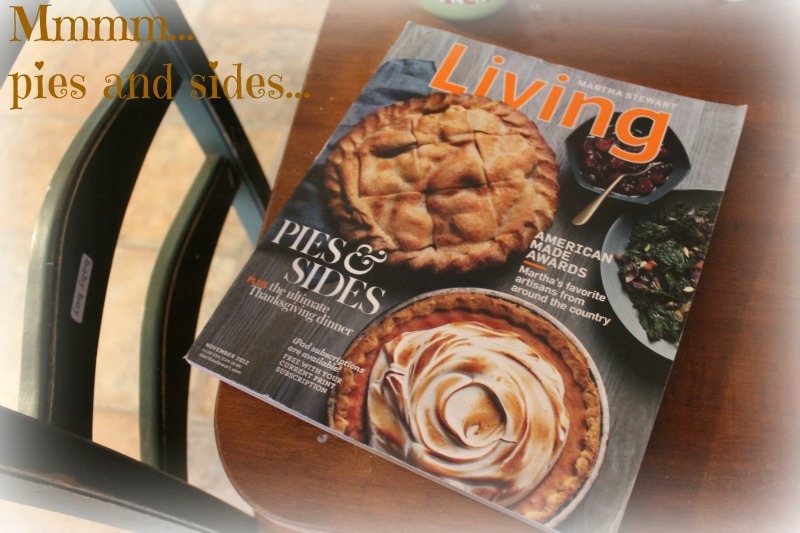 And I'm so much more enthusiastic about the food because I found my November issue of Martha Stewart Living. (It was buried under stack of magazines on the coffee table.) I loooooooove this issue! There are so many things I want to make. Anyway, back to loving my magazine. 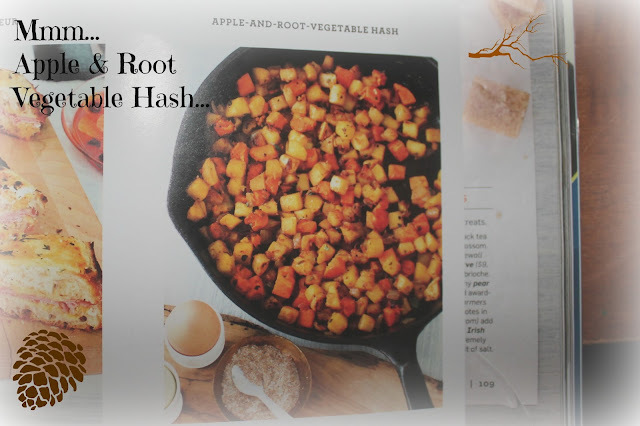 We've decided we're definitely making the apple and root vegetable hash recipe. There are so many great-looking fall and winter recipes, though, that I will probably be keeping this one on the counter through the season. I am a root vegetable nut. Beets, turnips, parsnips, etc... Yum. There is a tutorial for making paper kites (they're so pretty! 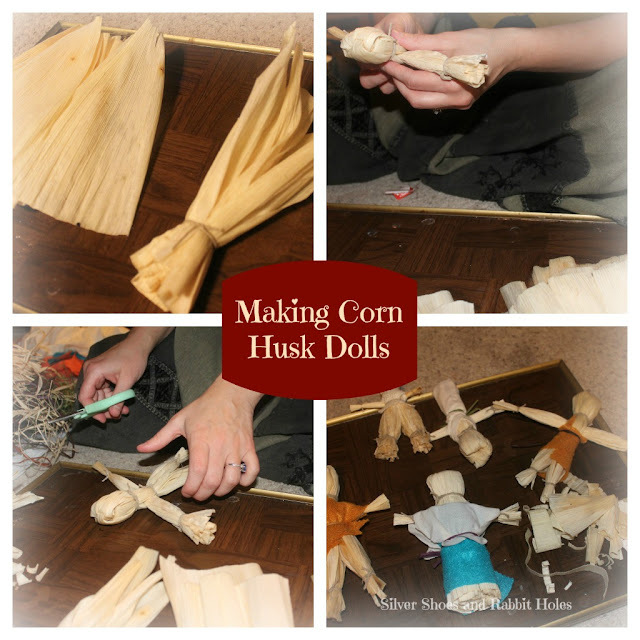 ), but we spent Tuesday night making corn husk dolls. We've made these before, although our first batch was slightly different. There are so. many. tutorials. out there. Even the one on the Martha Stewart website is different from the one in the magazine. I liked the version in the magazine for its simplicity. The girls were able to be very hands-on, and I only had to buy the corn husks. I raided our very messy crafts supply for everything else. I should tell you, the very first one we attempted did not turn out well. It was frightening. We started to see people-like creatures from the second attempt on. I think we'll bring them to my dad's and use them for decoration. They're rather cute. We can combine them with our older (naked) corn husk dolls. 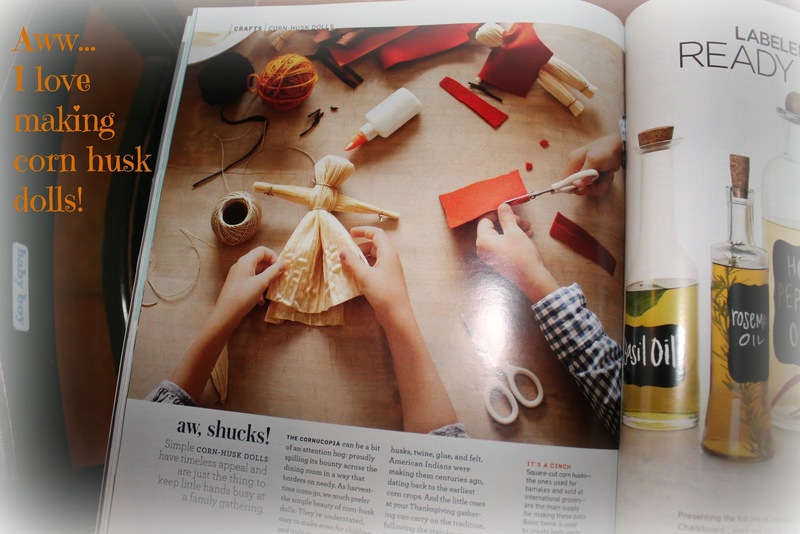 After devouring my magazine and making dolls, the girls and I settled in to read one last Thanksgiving-themed book. Milly and the Macy's Parade [by Shana Corey, illustrated by Brett Helquist. 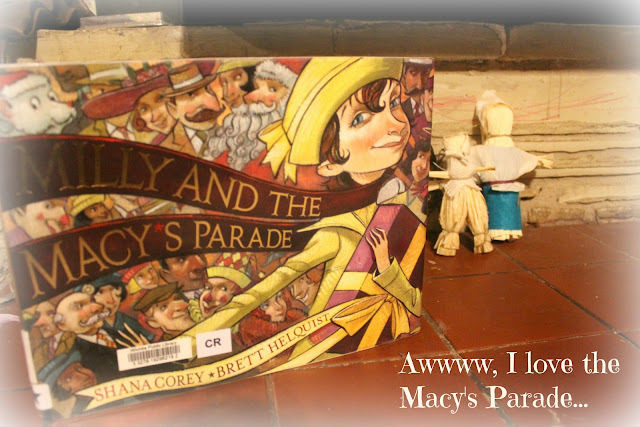 Scholastic, 2002] tells a fictional account of how the first Macy's Parade came to be, in 1924. Back then, it was called the Macy's Christmas Parade, but it was always held on Thanksgiving Day. The illustrations in this one are beautiful, and it did open up some short discussions. We talked a bit about immigrants coming to America. We talked about combining fact with fiction, to entertain and educate at the same time. We talked about how the Mr. Macy in the story wasn't real. The author explains in the Author's Note at the end of the book that the original Mr. Macy died in the 19th century. When we finished, I exclaimed, "I'm excited to watch the parade Thursday morning!" Big Sis shouted, "I can't wait to watch Miracle on 34th Street again!" Mr. Macy, the parade... she knows her old Christmas movies! These are so my children. I'll leave you with some lovely little YouTube videos of the parade in the '30s and '40s. 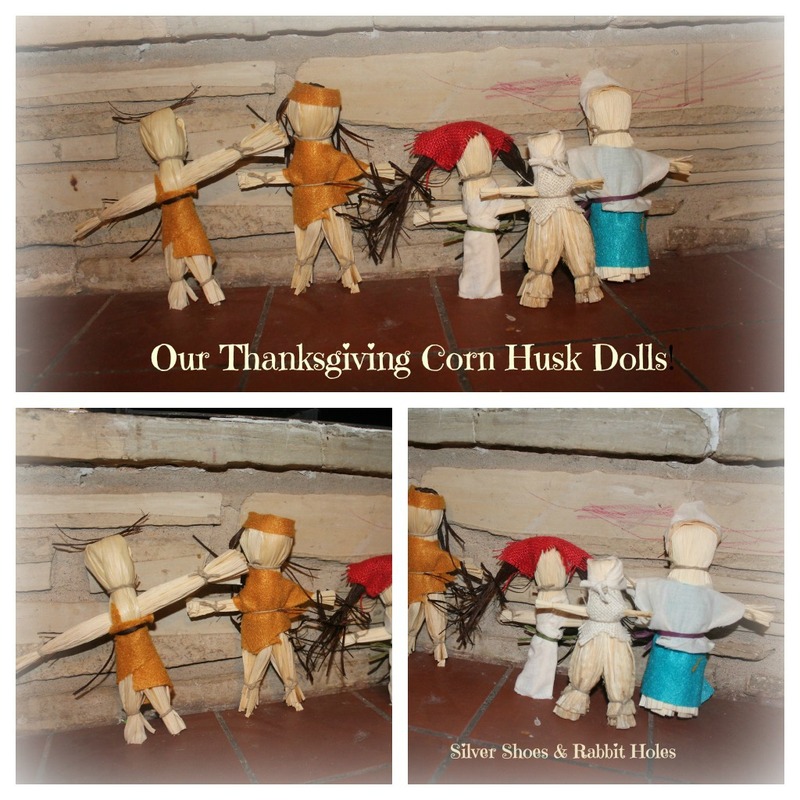 LOVE the dolls!!!!! y'all are so clever!!! 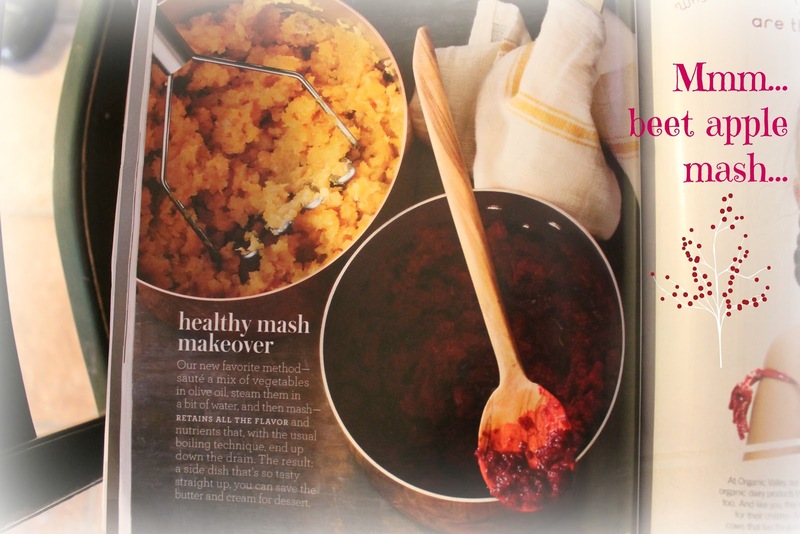 Love the mash and root veg -- I want some too! Happy tday! Happy movies! happy christmas decor!!!! Thanksgiving is much more low-key here in Canada. How many days off school do your kids have for the holiday? The US is GREAT at making things unnecessarily huge. (See Black Friday - I'll be sleeping in.) ;o) They're off today through Sunday.